Superheroes are huge in our house at the moment. The Avengers, the X-Men, Justice League, Spiderman, Kim Possible, Ben 10 and so it continues. There’s dressing up, watching movies and TV shows, a lot of made up stories and pictures drawn and coloured in. The smaller boys are racing around in their capes (black Batman and pink Super Girl for those inquiring minds who want to know) partially dressed in various other bits of costume. The action has ranged from one room of the house to another, from under the water, to flying in the air (Batman of course has a gadget). They’ve rescued the imprisoned cats, the enspelled older sister and defeated the evil older brother. They are having a brilliant time. Superheroes make me think. They stand for all that is good and right and just. But they’re also violent vigilantes who rarely outwit the bad guys, they just beat them in a fight. Actually, Green Lantern, Kim Possible and Batman are all fairly smart and do a lot of outwitting, but Superman? What kind of messaging are we sending to our kids when we glorify superheroes? Are we saying it’s OK to fight someone who is doing evil? Are we saying that we should stand up for the weak, the downtrodden and the helpless? Are we saying that sometimes it takes just one person to make a stand to make a difference? Are we saying that it’s OK to excel, to strive to do your best to succeed in life? Are we saying that learning to work in a team and that using an individual’s strengths as part of that team to lead to success is a bad thing? Or that being a selfish little beast who won’t accept anyone’s advice or help isn’t going to lead to success? Suddenly these messages don’t seem so sinister to me, and in fact, these attributes are to be desired – the level of violence in superhero movies, programmes and comics notwithstanding. For me, this argument is a bit like all the other ones to do with movies, programmes, comics and books. You take out of them what you want. Your children take out of them the messages that you already give them in your own home. These programmes can reinforce both negative and positive values, and it’s up to us as influencers of children to make sure the correct messaging gets across. I still don’t like all the fighting in these programmes. And I could choose to ban them in my house. But you know what? I find I love watching my kids take on a character, invent a story – either in a pre-established world or one they’ve made up themselves – play happily for hours on end and debate whether it is better to make a bad man good or to put him in prison. I love watching them colour in and draw their own pictures which tell often hugely complicated stories. And along the way they learn to play together, to cooperate and to stand up for what is right. Maybe they’d be doing this no matter they watched, but I do also have to say that I find these programmes more interesting than a lot of the other children’s programming – less saccharine, better characters, better stories, better drawings and animation. I wouldn’t love hearing that my boys had been fighting at school. But I would be proud if I heard the reason they were fighting was because they were stopping one child hurting another, or stepping in to help out a child who needed a defender. I want my kids to help others. I want them care for others and believe that as one person, they can make a difference. I want them to try hard and understand that one defeat or failure is not the end of the world. If superheroes help them to get those messages, then I am all for it. And in the meantime, to make sure they grow up big and strong, to be defenders of all that is good and right and just, I will call time on their play for today, and make sure they eat their dinners! 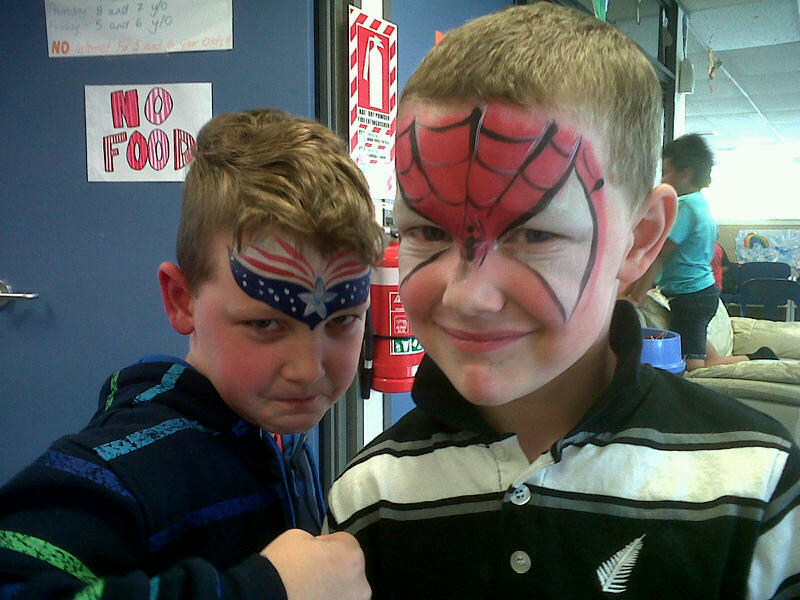 Apparently, Captain American and Spiderman are twins. Who knew?